Mobile telescopic boom lifts are perfectly suitable for work at height where the operator needs to get to a remote work site in the situation when it is impossible to drive closer. Such boom lifts are able to lift up to two operators to execute the works required. 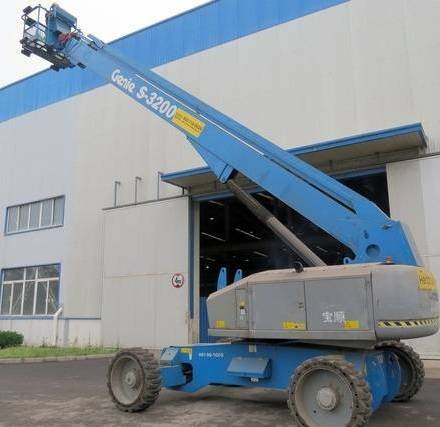 Telescopic boom lift Genie S-3200, with maximum working height of 32.4 m and loading capacity of up to 340 kg, can also be used on a slope at an angle of 25%. Being the versatile boom lift, it, however, has been specifically designed for the unique work at shipyards. Genie S-3200 is ready to withstand high humidity, salt water and strong gusts of wind, showing very long operation time. Fuel tank of 250 liters enables the 28-hour continuous operation of the boom lift. Genie S-3200 is equipped with the smooth and solid tires to work on uneven surfaces while minimizing fluctuations of the working platform.